I apologize if this has already been asked but I didn't see it when I read though the posts. I've noticed that when I use Iray certain things like Vein Set from the MASSIVE Morphs for Genesis 2 Female set won't show up in the Iray render but will show up in a normal render. Is there a setting that I need to adjust? I'm using the Iray sunlight and the Iray preset mat for Gen 2. I also noticed that the skirt which shows wrinkling in normal rendering also doesn't show the wrinkling in the Iray render, so I'm hoping it's just me not understanding the settings. It depends on how the veins and wrinkles are set up. IIRC both of those are HD Morphs. If I am remembering correctly, it is a simple fix. 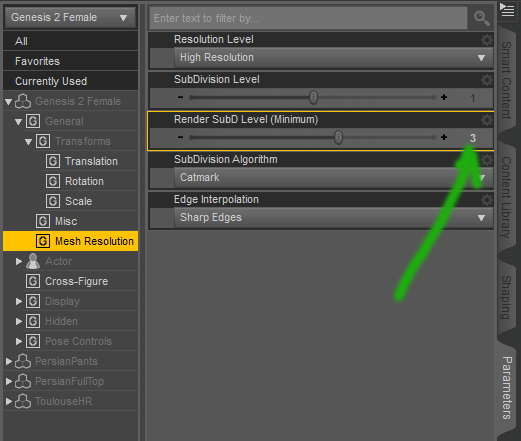 In your parameters pane there is a new setting called Render SubD Level (Minimum) which will need to be adjusted to use HD Morphs. For most HD morphs a level of 3 is sufficient. Shadow catching appears to be automatic. Dome mode: Finite sphere (just because HDR image was too low resolution for infinite sphere and in finite mode theres an option to adjust sphere radius). Except for reduced sphere radius, rest of the setting ware default. I've been looking at promo scenes from my products in Iray, and I thought you might be interested in the results. I'm not keen on the sun-sky environment in Iray. It gives good results, but I prefer a light I can look through to see what's going on. Setting latitude/longtidute, date & time is not my idea of fun, so I'm experimenting with the Photometric light instead. 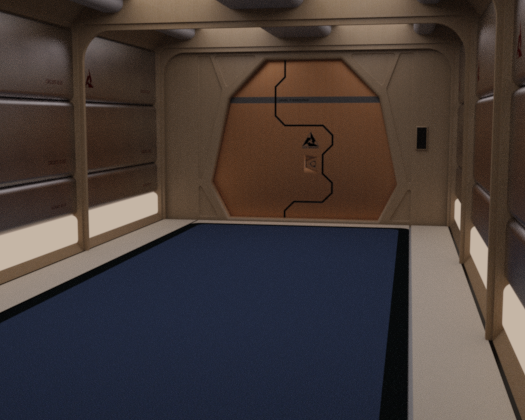 The last Iray render at default settings is of course, too dark, but I wanted a comparison. To get a better result, I would have increased the PM's Lumens, upped the film ISO or Ev. Re the Photometric light's dimension. Basically, the trick is, if you want harder shadows, decrease the size. for softer shadows, increase it. In photography, fill panels (large white panels) are used to fill in hard shadows and the larger the fill, the softer the shadows will be. so it's the same principle. Also, I would have added an emissive shader to the monitor screen, but I can't figure out how to add the texture to it. Can anyone tell me how to do that? As a comparison, here's the original promo rendered in 3Delight. I can't remember what the render time was. It has 4 lights - sun, room and 2 fills. Lat-Long, Time of year/day is only one way to use the sun. You can also use the sundial or just put an object in the scene (Usually a null) and on the environment section of the render settings you can go to the SS Sun Node dropdown pick your object. Wherever you place your object is the direction that the sun is coming from. As for adding an image to an emissive shader, set the emission color to white and add your map there, (also put it in the diffuse channel as normal). You may have to adjust the temperature to get a more correct color from the light, though 6500K should give you, about, what you are looking for. Your observation on Photometric lights is correct. Think it like comparing a bare photo strobe to a Soft box. Yes, I know about the sundial and null, but I still like to look through a light. After I posted, I played with the monitor screen and figured out the map had to go in emissive color. I don't have a diffuse channel though, and I had to ramp up emissive to a few billion to get a result. Still playing with it though. So, Nvidia is providing a free software to work with their cards. At least they were nice enough to make it work with just the CPU as well. I also do all the lighting in Watts instead of the default units, because my mind doesn't think in those units, but I sure know what a 120W lamp and 45W light are going to look like. p.s. Very nice renders! I really love the way interiors get lit with this renderer. Thanks! I'll give it a try when I get home tonight. ..OK re-rendered and saved to the right folder. ...OK have an interesting issue occurring. The three attachments below illustrate an odd anomaly I came observed when rendering a test scene in Iray. I had converted all the glass in the scene to the Iray Uber glass material so as to get the reflections I needed. As can be seen the elements of the shelter's interior line up differently with the window frame closest to the camera. This did not occur in the 3DL render test as can be seen in the attachments below. What appears to be happening is the Iray Uber Glass shader is for some reason distorting the imagery behind it. Same is evident in the bus behind the girls In RL this aberration does not occur unless the glass is very thick and viewed through at an extremely low angle. The glass in the shelter window is seen almost head on. In looking at the default refraction for the Iray glass material index in the surfaces tab set at it is1.55 which is on the high end for Crown glass (IOR range of 1.5 - 1.6). Though "physically correct", it apparently creates an unrealistic effect in the finished rendered scene. I tired the Thin Glass material, but it still presented the same IOR issue as the regular clear glass. Lowering the IOR of the glass does help but it also reduces the reflectivity quality as well. Wondering if anyone knows of a workaround. Fig 1, Screen Shot of the render settings. Fig 2. 3DL rendered image. Window glass should be set to a refraction of about 1.40. A little change to that setting makes a big difference. Yes, crown glass does and should create more distortion, more reflection and it catches more light within the glass, such as crystal. Generally speaking... the higher that number in the real world equals more expensive crystal. :) Also, yes, if the glass is thick, it will cause more distortion of the objects behind. The same thing happens with real world glass, such as looking through the bottom of a coke bottle.... if you can find a coke bottle anymore. ...I actually reduced it to 1.3 (water) and the distortion was still very evident. I'll give the "thin glass" material a try.to see if that helps. ...as to Coke bottles, I have a couple as we have Coca Cola from Mexico in the stores here (real cane sugar instead of that high fructose rubbish), and it still comes in the classic glass bottles. ...couldn't find one, ended up using Titanium for chrome which look pretty good. ...couldn't find one, ended up using Titanium for chrome which look pretty good. I opted for Nickel as Chrome has got some Nickel in it as far as I know. Yes sir. Setting scale multiplier to 10, and just dialling the dome radius between -30-10 did the trick. Cheers Zev0 for that info it helps me too. OK now I have to figure out how to get a mirror to reflect properly and why I am getting white artefacts in the one girl's hair (the one who is jumping).. I've tried all of the settings, still can't figure this one out myself. I think they need to add scale dials for each axis (X,Y,Z) of the dome. This will be extremely useful..Unless they already exist somewhere and I am just blind lol. Ah ha! Using a distant light instead of a null is a great tip!!! I'll definitely try that. I'm using watts too, but at high levels. I'm about to post some renders. Check the values to see what I mean. 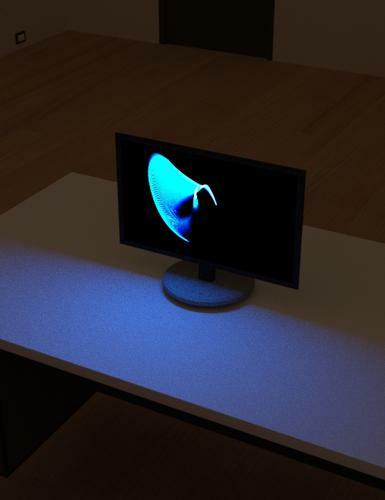 My experiments on the emissive shader with a texture - in this case a pc monitor with a screensaver. Luminous Efficacy is set to 20,000. All other settings as above. I tried a render at 50,000, but not many monitors give out that much light. It would depend on the rest of the scene and how it's lit. Excellent work--thanks for the tips. I much prefer the first because it looks like the bright part of the screen saver is what is lighting the desk. The second one doesn't look natural--like the 'black pixels' of the monitor are sending out as much blue light as the swirly whirly part. I've made a new video on lighting and creating a scene with Iray, for those that have been confused! I've been head-down in this thing for two days and I've done a lot of Googling and reading of PBR docs, so at least it's something. Please pardon my voice, I'm still not totally over this pesky "being sick" thing. The biggest thing I'm noticing about converting shaders with the Uber Base clicky is, always check for ambient, SSS and translucency settings. It natively seems to put SSS maps into the translucency channel, where they need to be, but if there aren't those maps you need to turn the translucency value way down. Skins that have the colored diffuse put into the SSS channel (Monsterina is one) are now borked. Iray is very sensitive to color in the translucency or SSS channels. DAZ's material for G2F puts Bree's colored SSS map in Translucency, but it's also controlled by a grayscale map in the "translucency weight" channel that was made specifically for this use. Basically, if you don't have two maps for that, you're going to want your skin translucency much lower than the .50 DAZ went with on their sample material. Their SSS is mapless. I prefer a specular/glossy shader type on the cornea and sclera and to just turn the reflection layer right off with cutout opacity, but that's a matter of personal preference. Great video, thank you SY! I have put together a free Q&D set of light and render presets for use with BETA Daz 4.8 and IRAY. Please note that some pages are still being worked on. If you get "permission denied" that page is not yet live. :) As I said, these are fluid through the beta. The pages with the most pertinent info are Tone Mapping, Environment, and the Iray Uber Surface shader pages, and those are all live and available. In this render, I set the light sources (walls and ceilings) to emissive. I changed nothing on the lights but to set them to 6500 Kelvin ('daylight'). This was just a quick render, I changed nothing else... no shaders, nothing. The tone mapping settings are still not quite right... but I stink at those. ok, still nothing special. I toned down the wall lights (5000 kelvin to make them warmer and 1500 luminance), slapped some metal and plastic shaders on the walls and doors and adjusted the tone mapping (ISO = 300, f/stop = 4). Even though unbiased rendering is great with light, to think that we can throw away all the tricks we've learned about lighting a scene is a fallacy. You have to think about it differently, but a lot of it still applies. This scene is in no way ready for a character or big prop. I'd need some more area lights or spots or points to give my subject the light I am really looking for. All I've done to this point is setup the environment to something like what I would want. I hope this information is of some help to someone. I realized I should have included a render with the default tone mapping settings so one could easily see the difference (these are much darker appearing on the forum than the renders appear on my monitor.. so I'm still not quite right). Anyway, these are default tone mapper settings of ISO 100 f/stop 8 with the lights the same as the image immediately above.